Posted on June 14, 2018 at 6:45 pm. Bring a large pot of salted water to the boil, add the pasta shells then follow package directions for cooking the shells (I cooked mine for 10 minutes). Drain, and then rinse the shells with cold water. Set aside on a baking sheet. Heat a wide skillet over medium-high heat. Add the sausage and cook until browned, about 10 minutes. As the sausage cooks, use a wooden spoon to break the sausage up into small pieces in the pan. Stir in the garlic, canned tomatoes and spinach. Cook until heated through and liquid reduced by half, about 2 minutes. Remove the pan from the heat then stir in the ricotta cheese. Taste for seasoning then adjust with salt and pepper to taste. Each shell is stuffed with a heaping tablespoon of the filling. You can stuff them on the baking sheet and then transfer them back to the pan to reheat. 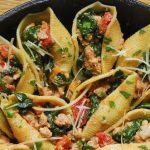 Spoon the remaining sauce over the shells and reheat for 5 minutes. They are ready to serve as is, sprinkled lightly with Parmesan cheese and parsley. To freeze shells: Make sure to freeze them on the baking sheet as individual pieces. Doing so will keep them from sticking to each other. Once frozen, shells can be transferred into a zip lock bag for storage. 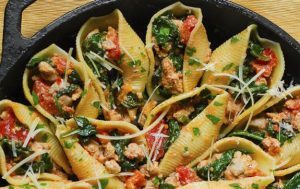 To reheat shells: Preheat oven to 375F, arrange the shells into the baking dish, sprinkle with LOTS of Parmesan cheese and bake for 25 minutes (reheating in the oven is the preferred way to reheat these shells if making them in advance – just make sure to sprinkle generously with Parmesan).